Add a line of text and choose a numbering/barcode option. 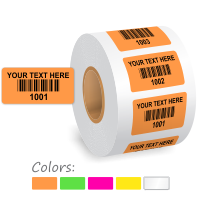 Available on a roll, these labels can be printed in different colors. Take your pick! great business transaction will buy from again.